It’s time for another Cute Outfit Ideas of the Week! Welcome to Edition #24 where we are talking about one of my favorite spring time prints – floral. Back in the 90s I went way, way overboard with the floral prints and have the pictures to prove it. I probably had around 10 floral dresses hanging in my closet. Hey, they were comfortable and they were cool. I try to balance out the floral these days and not go for the head to toe look. More like a floral shirt with jeans or a floral skirt with a cute shirt and wedges. You get the picture. But if I find a cute floral maxi dress, I’m buying it and wearing it proudly. 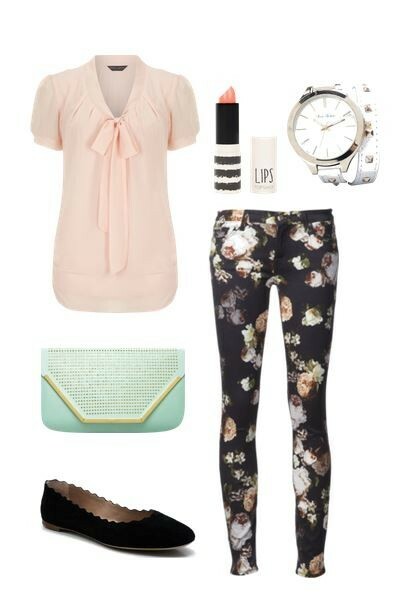 Take a look at the Cute Outfit Ideas for spring featuring the pattern floral. Let me know which one is your favorite! Looking for more Florals? Shop below! I love these, especially the floral jeans 🙂 Very chic ensembles.